Yet more fun with crappy Adobe products… Will the situation ever improve? Right now, on my Mac Pro 2009 running Mac OS X 10.7.4, if I open a publication in InDesign CS6 and then use the “Package…” command to create a complete package that I can send to the printer, I get an application crash each and every single time — and of course InDesign fails to create the package. According to reports on the Adobe forums, this is an issue that is specific to CS6 running on Lion 10.7.4 (or Mountain Lion Developer Preview 4). A user with Lion 10.7.3 cannot reproduce the problem. And the problem also occurs when deleting pages. Sometimes the dialog button is visible. 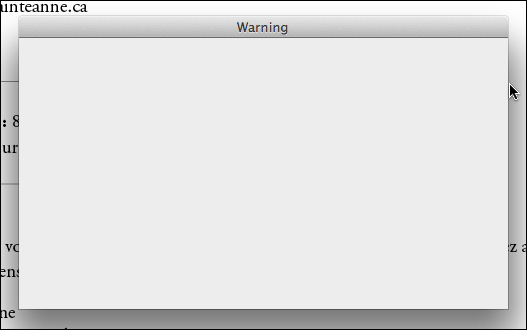 Sometimes the dialog box is entirely blank. In all cases, the application crashes within a couple of seconds of showing this dialog box, before you get a chance to click on anything. I believe that, normally, this warning can be disabled, but of course in order to disable it you need to be able to display it once properly and click on the checkbox to disable it. No such luck here. It is, of course, a royal pain in the neck. But if you are running CS6 and need to create packages for your printer, this is your only option at this stage, since there are no signs of Adobe coming up with an update to fix this any time soon. And they are also the most expensive applications that I have on my machine. What does that tell you? That Adobe is holding its users at ransom, and forcing them to use crappy software because it enjoys a near-monopoly in the graphic design market. This entry was posted by Pierre Igot on Thursday, June 28th, 2012 at 7:50 am	and is filed under Macintosh. You can follow any responses to this entry through the RSS 2.0 feed. Responses are currently closed, but you can trackback from your own site.